Last night, WWE was awarded the League Humanitarian Leadership award by ESPN. They received the award at the 4th annual Sports Humanitarian Awards in Los Angeles. “The Sports Humanitarian Awards is a celebration of the impact made by athletes, teams and sports industry professionals who use the power of sport to make a difference throughout the world,” a company statement reads. 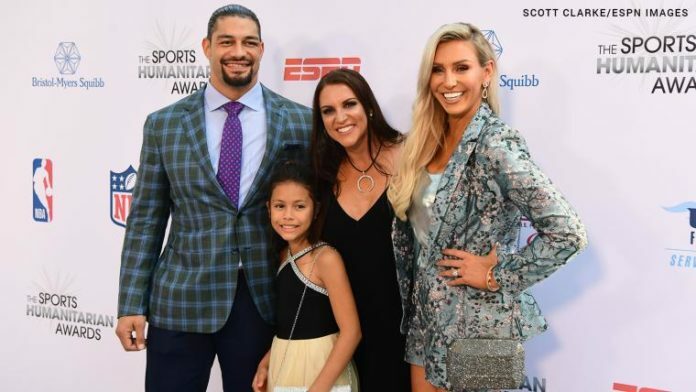 Roman Reigns, Stephanie McMahon, and Charlotte Flair were on hand to accept the award. “Our mission is to put smiles on faces the world over, and we will continue to use our platform to inspire social good!” WWE Tweeted. WWE has placed emphasis on corporate social-responsibility these last few years. Their work on the Be A Star and Conor’s Cure are two examples of CSR projects the company has spearheaded. Earlier this year, WWE organized the Mixed Match Challenge tournament. Each team picked a charity of their choice. The winning team would earn a donation of $100,000 to that organization. The winning team of Asuka and the Miz earned a donation to the charity “Rescue Dogs Rock”. The charity supports neglected or abused dogs and helps find them a forever home.